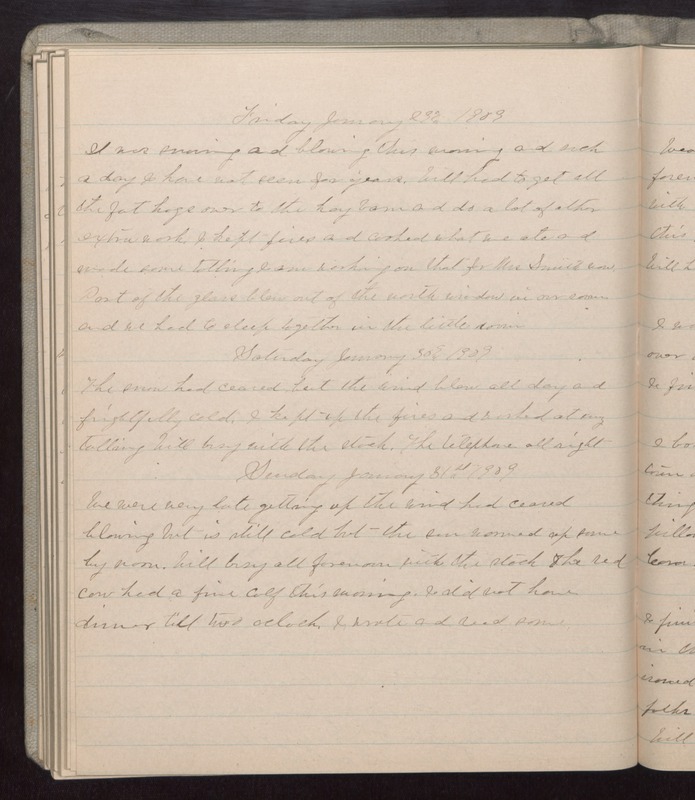 Friday January 23 1909 It was snowing and blowing this morning and such a day I have not seen for years. Will had to get all the fat hogs over to the hay barn and do a lot of other extra work. I kept fires and cooked what we ate and made some tatting I am working on that for Mrs Smith now. Part of the glass blew out of the north window in our room and we had to sleep together in the little room. Saturday January 30 1909 The snow had ceased but the wind blew all day and frightfully cold. I kept up the fires and worked at my tatting Will busy with the stock. The telephone all right. Sunday January 31st 1909 We were very late getting up the wind had ceased blowing but is still cold but the sun warmed up some by noon. Will busy all forenoon with the stock The red cow had a fine calf this morning. I did not have dinner till two oclock. I wrote and read some.